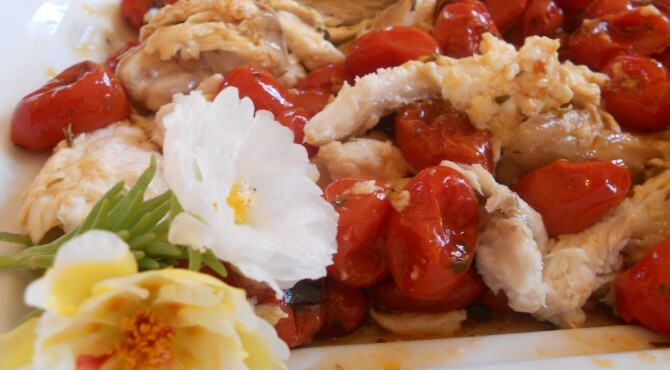 Secondi: pesce | CUCINA ITALIANA – ITALIAN FOOD | Il cibo con il sole dentro – With the sun inside! Put the meat to marinate in white wine and lemon juice for at least 6 hours. To prepare the breading, toast the pistachios in the oven to grill and then grind coarsely, join the cornmeal, salt, chopped chives and pepper. With holy patience dried orange peels or above the radiator (so it will perfume the whole house) or in the oven. When dry cut into small pieces and add to pistachios. Take the meat still moist and pass it on prepared powder. Cook the chops in the oven at 200 ° for 20-25 minutes, and then on the grill for another 5minutes. Clean the artichokes from the out leaves and cut them into strips. Saute the onion and the garlic finely chopped in a pan with olive oil and add the artichokes, add white wine. After 10minutes of cooking add the parsley and take half of the artichokes. 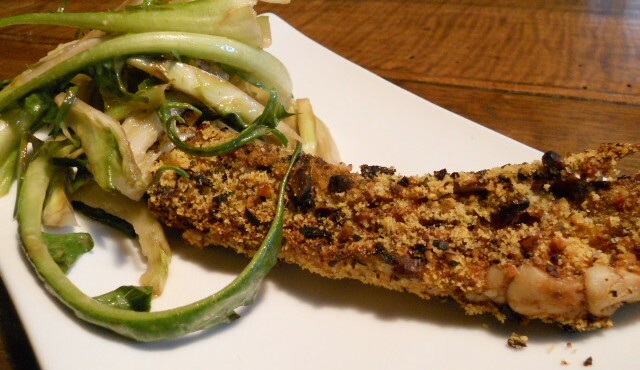 Cut them into small pieces with a knife and mix with the breadcrumbs. With this mixture fill the cuttlefish (Do not fill too full because it swell during cooking). Put the squid in a baking oven with olive oil, adding the remaining artichokes, sprinkle with salt and pepper and bake at 180 degrees for 20-25 minutes. 4 shrimp per person, 20 slices of bacon thinly sliced​​, 1 slice of pumpkin, half cabbage, 1 onion, 1 clove of garlic, 1 potato, salt, oil, vinegar, chili. Peel potato and pumpkin and cut into cubes. In a large saucepan with olive oil brown chopped onion and garlic, add the cabbage, cut into slices, two tablespoons of apple cider vinegar, and the vegetables into small cubes, cover with water and boil for 20 minutes , adding salt and pepper. When cooked, put them in a blender to obtain a paste. Peel the prawns and roll with slices of bacon. 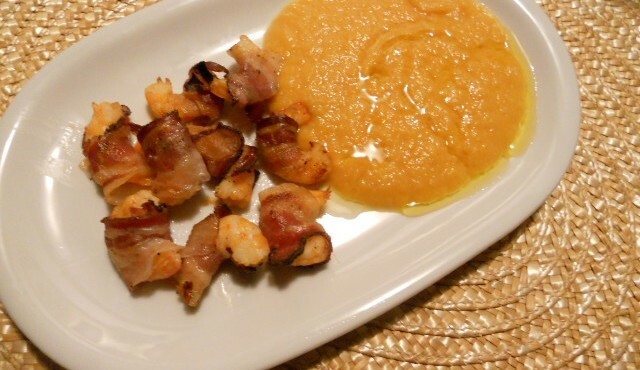 Cook on grill until the bacon is crisp and served hot with cream of pumpkin soup with a drizzle of oil. Cut the pine nuts and parsley with the crescent, mit it to corn flour, seasoned with salt and chilli. Whisk the egg white. Shell the prawns and place 3 for each swab, put the skewers in the album and then in corn flour and fry for a few minutes in hot oil. Serve it with my hot sauce. 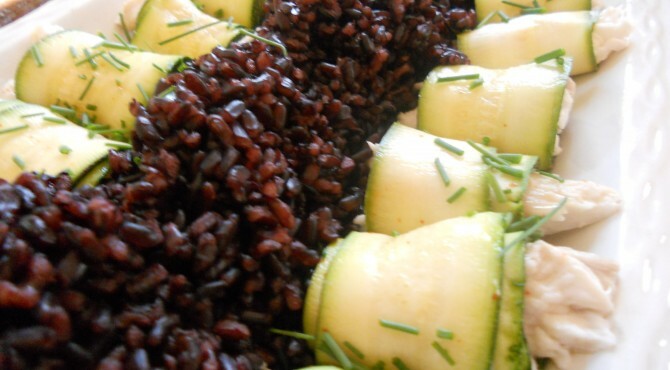 Cut the zucchini into cylinders 5-6 cm high. Helping with an small spoon dig for ¾ . Boil water and blanch the zucchini for 4 minutes. Pass them immediately in cold water to stop cooking. Cut the salmon into cubes and season with lemon juice, cream, salt and black pepper. Fill the cylinders with salmon and cook in oven at 200 degrees for 15 minutes. Serve hot with a sprinkling of fennel or dill. Remove the scallops from their shells and wash them carefully. 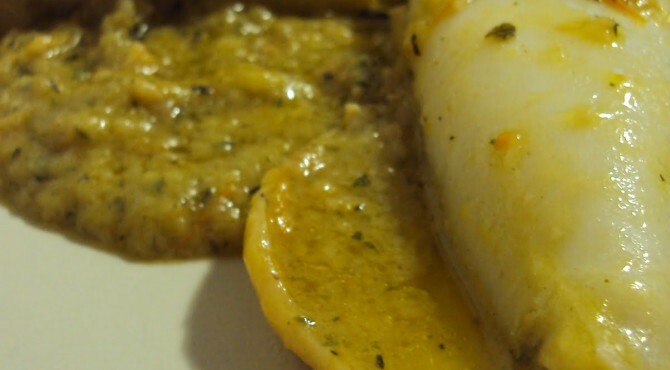 Fry a clove of garlic cut into small pieces in a pan, add the scallops and the brandy and cook for two minutes. Add the cornmeal, salt and pepper and parsley and continue cooking over a bright fire for 2 minutes, until the flour becomes crispy. 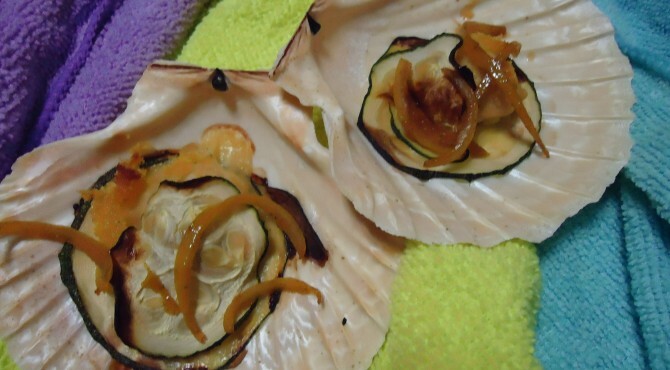 Cut the zucchini into thin slices: put one slice in the shell, the scallops cooked and cover with another slice of zucchini. Cook in grill oven for a few minutes. Cut the lemon peel into strips (only the yellow part and not the white because is bitter!) Cook it in boiling water for two minutes. Drain. In a saucepan put the sugar with abundant chilli, and put the fillets of lemon peel and caramelize. When the scallops are cooked, garnish with caramelized lemon. Cook the dogfish steamed for 20 minutes. When ready cut it in small pieces. In a baking dish put in the tomatoes with a generous sprinkling of chopped herbs, salt, pepper and sugar and two tablespoons of oil. Bake in oven grill until the tomatoes are light brown, and will have created their own liquid. 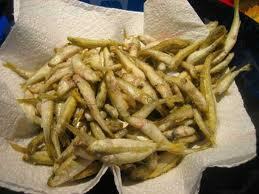 Let them cool down and then add to the dogfish.Keep in refrigerator before serving. Clean the squid by their inner and peel them. Soak the bread in water, squeeze when soft and add the onion and garlic thinly sliced, diced zucchini, salt, pepper, basil and parsley. 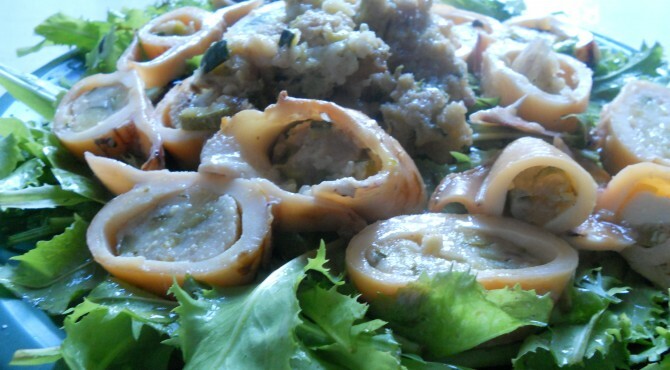 Fill squids with the mixture and close with toothpicks. Bake at 200 degrees for 25 minutes adding white wine and seasoning with salt. When they are cooked, let cool before cutting. Serve it on salad dressed with oil, salt and balsamic vinegar. Cut the courgettes in very thin slides, and marinate with lemon juice, sprinkle with salt and pepper. The dogfish steaming for 20 minutes (if you do not have the steamer, overlap two pots the lower with water, and cover with the lid on the top). 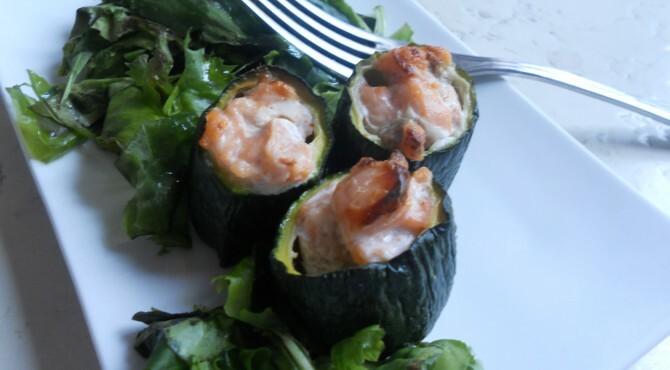 When the dogfish is cooked, sfiletcut it in small pieces and dial the rolls with the courgettes and the fish inside. Serve it with with boiled rice Venere, a splash of lemon and a sprinkling of chives. Passiamo la lattarino in acqua fredda. Scoliamo e facciamo saltare nello scolapasta con la farina , in modo che parta la farina in eccesso. 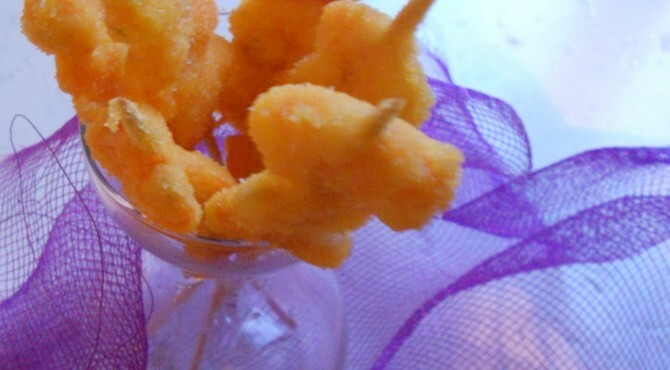 Facciamo cuocere per pochi minuti in olio da frittura molto caldo, altrimenti si rompono. Scoliamo dall’olio e serviamo insieme alle salse.